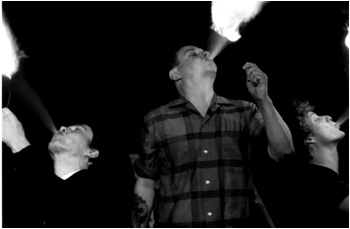 Hailing from Chicago, IL, JUST A FIRE first started their sonic assault in December of 2002. Playing songs inspired by an urgency to protect free speech and privacy in the age of the Patriot Act. The goals are simple: To play music and be with friends without being troubled by the snake in that Bush. The band consists of Fred Erskine (JUNE OF 44, HOOVER) on bass and vocals, Chris Daly (SWEEP THE LEG JOHNNY) on guitar, and Scott Adamson (SON OF ADAM) on the drums. Heavily inspired by THE CLASH, THE POLICE, AC/DC, LEE “SCRATCH” PERRY, and many others.